A literature review of 3 – 5 books, articles or papers which have influenced your practice or understanding and have helped to shape you as a professional. Each of the texts I chose to include made me sit up and reconsider both my values and beliefs about education as well as informing my approach to teaching and learning in the classroom. I hope that you find it to be a stimulating read. Comments are welcomed. If you would like to know more about the MA in Education that I am studying towards, look here. Having turned 30 this past December I often find myself thinking about my brain, impressed by the fact that it keeps working; consuming more information all of the time. This in turn gets me to thinking about my students brains and what my role is in helping to fill them, which brings me to the purpose of this post. Once a week I am going to focus on a quote from literature to help illustrate a point or idea. 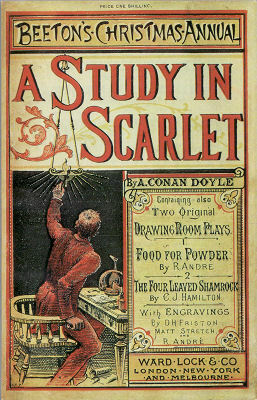 For the 1st of these posts I wish to direct you to chapter 2 from Sir Arthur Conan Doyle’s first Sherlock Holmes novel: A Study in Scarlet. Watson is amazed by both Holmes’ knowledge and his ignorance after discovering that he was unaware of the fact that the Earth rotates around the Sun. Holmes explains his apparent shortcomings quite wonderfully. “But the Solar System!” I protested. It is at this point that I turn to the title of my post. It is clear that if Holmes were alive and kicking in the 21st Century he would be very pleased with the current system of British education – specifically the ‘narrowing’ or ‘specialising’ process (depending on how you view it) that takes place at 14, 16 and 18 years of age. By the time a young person leaves university they will have surely emptied their “brain-attic” of any and all “useless facts”, keeping only the “useful ones” in pursuit of their chosen career. However, I believe that both the great Sherlock Holmes and the current system of education in Britain are wrong. Holmes’ usually exquisite reasoning has failed him. In the 21st century it is unlikely that any person leaving education will have an exact understanding of what their future career may be. Jobs change frequently and new ones are invented all of the time in a world that never stops moving, never stops adapting and evolving. It is therefore, impossible to say that any one piece of information is “useless”. What may seem like a trivial nugget of knowledge may one day be a vital component of someone’s “brain-attic” helping them to complete a task or to forge ahead with their chosen career. While I appreciate that some of you will disagree with me, I for one, am tired of hearing the following question come from a 15 year-old’s mouth: “What do I need to know this for? I don’t see why I need to be able to read Shakespeare in order to cut someone’s hair!” For me this exemplifies the flaws in Holmes’ thinking. While being able to read Shakespeare may not help the 15 year-old to cut hair after they leave school at 16 it will have taught them something about British heritage; it may help them two years later should they become dissatisfied with their chosen career and decide to go to college; and it might certainly be useful to them when they have their own 15 year-old who is reading Romeo & Juliet for the first time and they are asking mum or dad to sit down and read it with them. Holmes may not be completely wrong though. There probably is some knowledge that will be useless to us no matter what but even the most benign facts such as the name of Katie Price’s current husband will be useful to someone: a journalist at the Sun newspaper perhaps, a celebrity blogger or a university professor who teaches their students Media Studies or Social Studies. The fact of the mater is this: No information is “useless”! The current system of education in Britain is telling young people that some information is more important than others, that some subjects are more valuable than others and that it is okay to ignore information, ideas and thoughts if they don’t bare some direct relationship to the subjects they are taking or the career path they have decided to follow. This for me like Holmes’ explanation if his own ignorance is very problematic. I personally feel let down by my own education – I was not fully prepared for the rigours of the working world and like so many learned just as much working as a part-time supervisor at Superdrug as I did studying for my degree. I learned to use Maths properly on the job – having been allowed to give it up at sixteen. My wife, an Arts History Major from the College of Charleston, SC, USA was still taking ‘Math’ classes while obtaining her degree – the application of number being actually quite important to the day to day running of a gallery or museum. On the job I also learned to use Excel with real purpose rather than the laughable task used by many ICT teachers today – to plan a party on an Excel spreadsheet – who does that I ask you? Who plans their parties using Excel? I don’t – a paper and pen usually suffices! If I had been made to continue with a broader range of courses I have no doubt that I still would have made it to University but I may have had greater choice about what I wanted to do. I may have retained more of that useful Maths that I struggled through at GCSE but only saw the true value of when as a University student I was promoted from Shop Assistant to Supervisor – a position that meant I had to balance the tills at the end of the day, squaring away the days takings. It was worth it for the pay rise that came with it but would have been easier if I had not been allowed (encouraged in fact) to let that “useless” Maths (like long division and percentages) be elbowed out of my “brain-attic”. I am grateful to my time working in retail – it meant that I had the expertise to pass my QTS Skills test in Numeracy during my PGCE. In fact as an English PGCE student this and the ICT test were the exams I feared the least. I was more worried that my spelling or grammar would let me down on the Literacy test. This ill feeling mainly being the product of not wanting to embarrass myself more than anything else. The word count reads 1279 so I had better come to some sort of a conclusion! A child’s brain is like an empty “attic” and it i my job to help fill it but not simply with Shakespeare, Browning and Miller; not simply to be able to analyse a quotation or dissect a scene from EastEnders but to teach them to question the status quo; to conduct primary and secondary research effectively; to understand the links between social media, geography, politics and class amongst many other connections that can be made between subjects, ideas and thoughts. My students’ “brain-attics” have walls but they are pliable, expandable, not set by stone and mortar. They are open to using technology to aid their learning but also to know when to put it down. They appreciate, because I will them to, that Art is as valuable as English and History is as valuable as Maths. And you know what their is enough room in their “brain-attics” to take it all in! Posted on Wednesday, 17 February 2010 Sunday, 4 May 2014 Categories EducationTags blog, blogging, brain-attic, britain, education, learning, literature, quotes, reading, sherlock holmes6 Comments on A Very British Education.